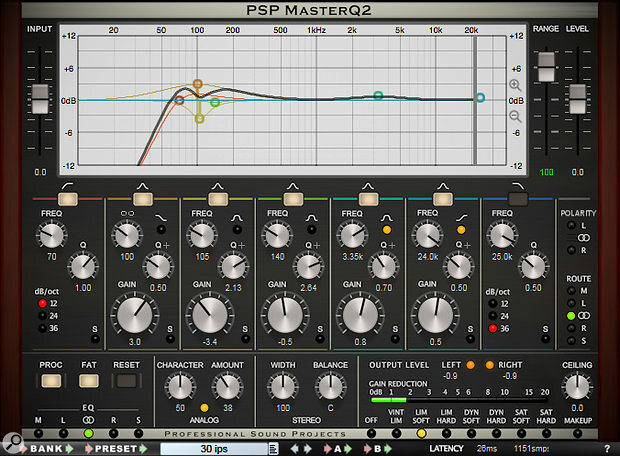 When I reviewed PSP’s original seven-band MasterQ equaliser plug-in way back in SOS June 2004, I was impressed with its sweet oversampled sound and its incredible versatility. It has continued to find its way into my songs over the years, thanks also to its array of limiting and soft-clipping algorithms, which prevent harsh digital clipping in favour of a selection of gentle compression characteristics. Tests have shown if you can exactly match their frequency response curves, many digital EQ plug-ins sound vanishingly similar, so you might as well choose one with a graphic interface you find pleasing or most easy to use. The exceptions are those that model some sort of ‘analogue’ behaviour, such as the aforementioned soft clipping or low-level harmonic distortion — which brings us neatly to MasterQ 2. PSP’s basic design remains the same, with a graphic display of the overall EQ curve in the upper portion, and controls for up to five parametric EQ bands plus high-pass and low-pass filters beneath. However, almost every aspect has been enhanced in some way or another. For starters, apart from the usual 12 and 24 dB/octave options, its high-pass and low-pass filters now offer an extra-steep 36dB/octave slope, which is particularly handy for removing cone-flapping subsonic excursions or high-frequency aliasing. The outer two parametric bands still offer a shelving option as well as the normal peak response, but all five peak bands also now have a ‘soft’ peak mode that flattens the tip of the EQ curve for a sweeter sound when you have to dial in severe equalisation settings. Clicking on the plus symbol next to the Q label switches the EQ skirt to a different shape, more closely matching that of some analogue EQs. MasterQ 2 also features the ‘frequency hunter’ mode first seen on PSP’s flagship Neon EQ, which isolates the audible effect of a chosen band to make it easier to home in on unwanted frequencies in your material, and the ‘linked filters’ mode that moves all band frequencies simultaneously, making it easy to tune them individually to different harmonics of the first — perfect for notching out hum-based interference, for instance. The EQ can be applied to the full stereo signal or just the left, right, Mid or Sides signals, which, together with the new stereo width and balance controls, gives you much greater control over the final stereo image. You still get the same generous selection of seven limiting/saturation options, from the transparent ‘VintLim’ to the more obvious soft and hard-knee saturation, but the addition of the new Ceiling knob, gain-reduction meters, and automatic make-up gain option extends the usefulness of this section from clip-avoidance to many more creative applications, such as overdrive and heavy pumping effects. However, for me the most welcome feature is the new ‘Analog’ section, which models the subtle harmonic contributions of components such as driven transformers, the effects of which are felt most at lower frequencies. Using its Character knob, you can dial in only odd harmonics or a combo of odd and even. You can also adjust the overall level of these harmonics, and with the Analog button enabled, each active peaking band contributes its own ‘mojo’ to the cumulative effect, so you can add warmth even when the EQ is set totally flat. By now, you’ve probably realised that I’m a fan of PSP’s MasterQ 2. I liked the previous version, but this one offers much more, being both an extremely flexible mastering EQ with surgical precision when required, and a very flexible design tool for more extreme purposes. The latency is still around 1100 samples (26ms at 44.kHz), so it might not be the ideal tracking tool, but for mixing, sound design and mastering I love it to bits!